While the bill originally promised a headlining set from radical industry disruptor Chino Amobi, a bad case of food poisoning had other ideas for the Richmond, VA artist and the third night of X Avant. 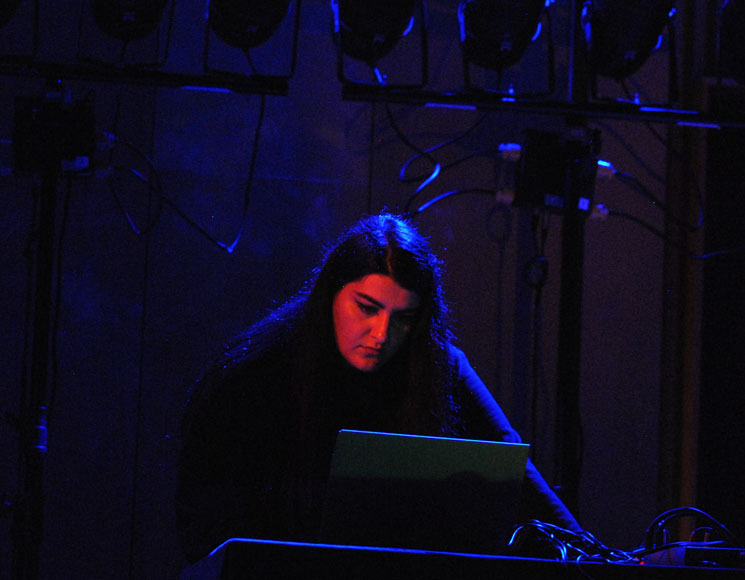 Tapping local E-Saggila (the noisy techno project of Summer Isle Records founder Rita Mikhael) as opener in his stead, the festival welcomed audiences into another world of hostile sounds, right on time for a Friday the 13th. Transforming the modest church into an apocalyptic cathedral, E-Saggila's atmospheric assault sprawled out in ricocheting kicks built to break sternums, detonations pinning everyone down for extended industrial lashings and paralysis-inducing pummels that gave way to blissed out techno and gargantuan fanfares like secret levels of euphoria that could only be unlocked by violent rapture. 918 Bathurst effectively carved into a foreboding temple of unwelcoming brutality, a circumstance-bumped presentation of Intérro assumed the headlining slot, chasing the harsh ambient reckoning with a postmodern expressionist investigation of post-9/11 culture. A mutli-disciplinary performance piece featuring poets Tanya Evanson and Kaie Kellough, Kevin Lo (visuals), and Jason Sharp (bass saxophone, sound design), Intérro scrutinizes the interrogative nature of contemporary border crossing with crowd-sourced accounts from security screenings and aggressive aural accompaniment. Opening with frenetic bursts of garbled English and windy saxophone improv, as the piece went on, familiar questions revealed themselves at first in fragmented Burroughs-ian language cutups and eventually, the breathless interrogative vocabulary that has embedded itself in the noise of post-9/11 life: "Is this your computer?" "Are you sure he's your friend?" "Where are you from?" "We can check your Facebook." Plugged into his signature rig of heart rate triggers, as Sharp's saxophone growls grew to match Evanson and Kellough's increasingly panicked vocal deliveries, so did his pulse, and as your mind raced to keep up with the gauntlet of psychic alienation, it was hard to imagine a worthier application for Sharp's system. For sure, anything from the duty-free, borderless state hyper-idealism of Amobi's anxiety cataloguing Airport Music for Black Folk or the hostile collages of PARADISO would've capped it all off with a thematically fitting, heady flood of catharsis, but Intérro made a fine headlining presentation, and by the time its keepers left the floor red in the face and out of breath, it was difficult to imagine anyone following what they laid down.